The DreamServer Affiliate Program works as a referral service, where we reward you with up to 20% per referral each month, just for spreading the good word about DreamServer. You can refer your friends, family, clients, coworkers, in fact absolutely anyone who need our services! Can you drive a large number of sales? Do you have a related product that you can offer along with our services? We are always looking to form solid partnerships and develop strong relationships. Please send us an e-mail to: affiliate@dreamserver.ro to discuss special arrangements. To signup for the DreamServer affiliate program, please visit: https://dreamserver.ro/register.php. 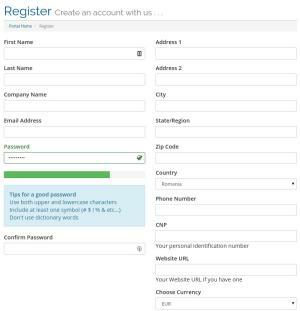 In the registration form, you will be required to enter first and last name, company name, your email address (which will be your username), password, address, etc. Once you have filled out your personal information, you must provide a valid email address and your website’s URL. If you do not have a website, you can indicate “no website”. The next section will allow you to choose currency. We understand the need for different payment and currency options and we allow our affiliates to get paid by PayPal, BANK Transfer or hosting credits in DreamServer. You may change your preferred currency and payment method any time later. Lastly, make sure you read our terms of service and you’re all set! You will receive an email with your login credentials. This Affiliates page provides a quick summary of everything you need to know in regards to your affiliates. 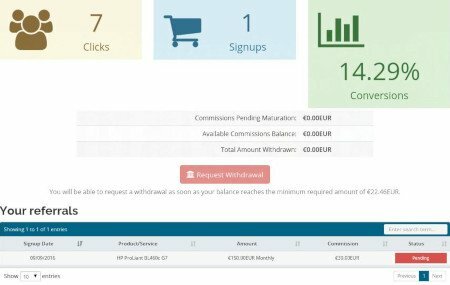 Here you will find your traffic overview, like clicks, signups, available commissions, referrals products and here you will be able to request a withdraw as soon as your balance reaches the minimum required amount of 22,46€. Log-in to your affiliate dashboard, go to the affiliate page https://dreamserver.ro/affiliates.php. and enter your email and the password you received in your welcome email and you will see your affiliate link in middle of the page. This link will allow us to accurately track all of your referrals and automatically award affiliate commissions. All available banners and other marketing material you will find on Affiliates page . Using the different banners to promote DreamServer is easy, you need only to copy and paste the HTML code to the page you wish the banner to be displayed. You can also use social network to share or tweet the banners with your affiliate link. Payments are automatically processed on a monthly basis. In order for your payment to be included during the monthly payout, your balance due must meet our 22,46€ threshold for PayPal, BANK Transfer or Hosting Credit.